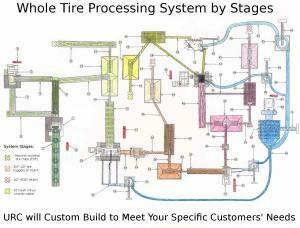 Unlimited Resources Corporation currently has for sale all the major equipment (components) to custom build a complete whole tire (passenger/semi-truck) processing system. We have custom built this system with the capability to produce several different size products, giving you the opportunity for multiple revenue streams. Note: all this equipment has already been refurbished and is currently in our inventory. Two inch nominal tire chips (TDF)- The plant that we have configured would have the capability of producing around 7-10 tons if you only used the Primary two speed Columbus McKinnon tire shredder in conjunction with the 4’ X 30’ Action finger screen classifier. If you were to need more production than that we could add a Columbus McKinnon chipper to this system and get the production of this TDF tire chip up to 15-20 tons per hour. ¾”- ½” tire nuggets or mulch- The plant we have configured would give you the capability of producing around 7,000-8,000 lbs per hour of this product that would be 90-95% wire free. We would accomplish this by using a Granutech/ Saturn model 80 Grizzly with either ¾” or ½” screens installed in it. ¼”- 3/16″ mulch- The plant we have configured would have the capability of producing around 3,500-4,000 lbs per hour of this size product that would be 97% wire free. We would accomplish this by using a Cumberland model 50H granulator with either ¼” or 3/16″ screens installed in it. We could easily double this capability by adding another of these Cumberland’s that we presently have in inventory. 10 mesh minus crumb rubber- The plant that we have configured would have the capability of producing around 3,500-4,000 lbs per hour of this size product that would be virtually wire free. We would accomplish this by using a 24″ X 32″ double roll cracker mill. You would be able to screen off several different sizes of crumb at this point with the addition of a multiple deck Rotex screen if you had the market for a certain particular size of crumb. To achieve making all these different sizes of products many different pieces of peripheral equipment are required such as belt conveyors, auger conveyors, surge bins, magnets, and aspiration equipment. We have many of these currently in inventory and some additional items would have to be purchased new. This system can be configured in many different ways to produce whatever size product your customer’s need. It will also give you lots of flexibility with the opportunity to develop several different income streams in case one of your markets goes away.